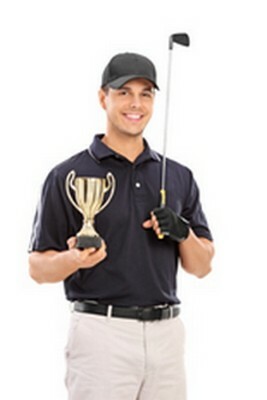 "I went to Eileen, with just a hint of scepticism, to improve my golf. I practised well, but played badly on the course. Eileen is a great listener and gave me a number of strategies for dealing with different mental aspects of the game. I still use these methods, and there is no doubt that my game has significantly improved as a result. Thank you!" "Thank you!! I played in a competition yesterday morning and posted my best score of the years so far!! And I came second overall for the day. I'll be in touch again!" "On a couple of occasions when working with Eileen in a one to one situation, she led me through the EFT process and on both times, there was a shift in my perception. We worked on an improvement in my golfing performance and within a short space of time, I actually achieved my target handicap for the year"
EFT is a cutting-edge technique that can be used for overcoming subconscious blocks that might be holding us back in life ...without us even realising it. If we're training hard, practising from dawn to dusk, and doing everything we know how to do to try and reach our goal, but it's just not happening, no matter how hard we try .. then EFT will help you uncover the any mind-blocks that are sabotaging your success.